"Playing the vulnerable Princess Katherine, Lisa Crosby Wipperling did great justice to the part, and this is important in light of the fact that feminine roles and domestic scenes in Shakespeare’s histories are scarce. Though Wipperling’s role is not large, her scenes provided welcome comic relief and elicited a tender side of her suitor/conqueror." Copyright © 2016 by PlayShakespeare.com. I was cast as a guest artist to play the role of the Witch and had a blast working at my Alma Mater with some very dedicated college students and community members on a four-foot raked stage and full facial prosthetic makeup. What a beautiful experience. This link is to an article written about a live interview taken with Hazel Rose Gibson, the Stage Manager, and myself at Morningside College. "As the Lady of the Lake, Wipperling is responsible for helping King Arthur and his knights, either by guiding them, encouraging them and even performing a makeover. As if that wasn’t enough, she performed a couple show-stopping songs, earning every bit of praise and applause." Since this play is new to the region, I won’t divulge the various roads the characters take to chop down all the obstacles they encounter in the appropriately named the Haywire Lumber Camp. ... These lumberjacks are all OK.
http://offoffbroadway.broadwayworld.com/article/Photo-Flash-First-Look-at-Going-to-Tahiti-Productions-IN-THE-EBB-at-FringeNYC-20120811 no specific comments on my performance, just an inclusion of cast names. "Unlike the chorus in the conventional staging of a Greek tragedy, the connective tissue is supplied by a guitar wielding orderly (Will Turner) and a zesty, riotously entertaining chorus of hospital nurses (Kelechi Ezie, Lisa Wipperling, Emily Brown, Bonnie Milligan, Lauren Hayes, Whitney Conkling), who seemingly have a tune on hand for every gruesome occasion. The nurses sing (including a stirring rendition of Paul McCartney’s “Blackbird"), they dance and are particularly hilarious on their hands and knees scrubbing the floor while singing the blues. On occasion, they also give a great amputation." - The Broadway Bulletin. Lisa Crosby Wipperling (Tracy) "neat & tidy has changed my life. Failing has become necessary on a daily basis in order to grow and travel to where it's necessary to live with this character. That place changes just enough each day where I end up chasing Tracy to keep up. The relationship has been rocky but well worth it. Steven's workshop process kept me on my toes daily and was very rewarding. The development of character, relationships and team is the most important part of relaying the message on an organic level." Playbill.com advertisement article and pictures. 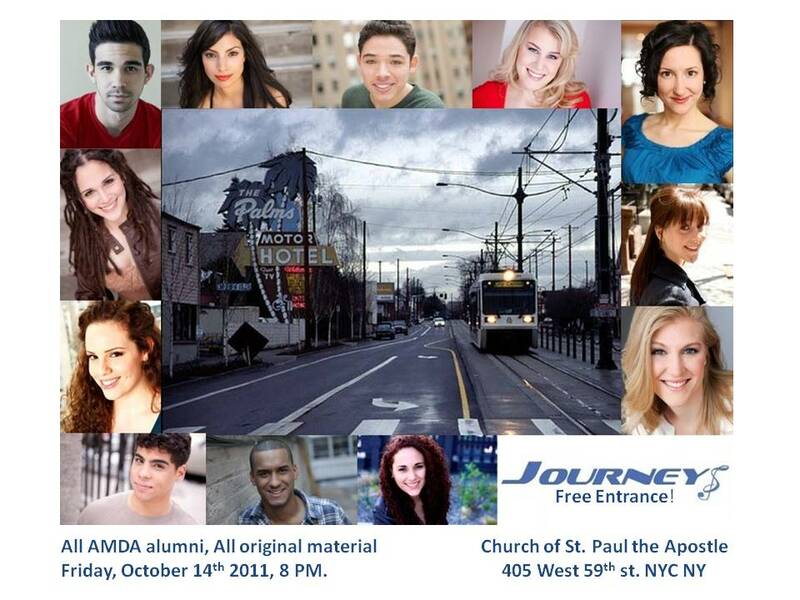 Journey's Cabaret NYC Cast List and publicity for the show. I composed an original song and arranged it for the group. I love writing original music and appreciated the opportunity to be showcased. Poster Advertisement with all of our head shots and performance information. About the Artists NYC: An incomplete collection of the New York Shows I've Done and Actors I've worked with. I do not have control of this list so it is missing The Tempest, concerts and webisode. Incomplete Bio Online, I do not have control over it's creation.